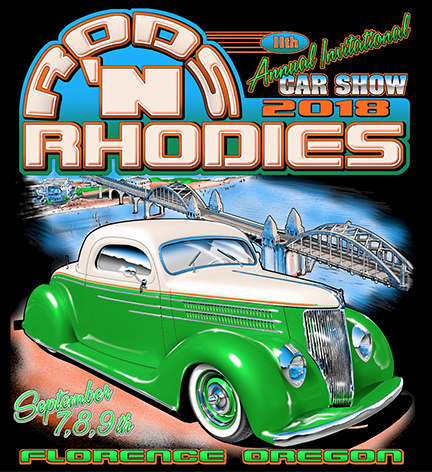 2018 Rods ‘N Rhodies 11th Annual Invitational Car Show! Top Hot Rods and Classic Cars to Shine! The event showcases up to 125 of the best high-end hot rods and custom cruisers from 1976 and earlier. Because Rods ’N Rhodies is an invitational, you know you’ll see some of the West Coast’s most gorgeous, amazing, awe-inspiring hot rods at different venues all weekend. Be sure to snap up a copy of the garage sale guide at the Siuslaw News office (148 Maple St.) or online at TheSiuslawNews.com, or the Chamber of Commerce office (290 Highway 101) and enjoy your own personal episode of the famous “American Pickers” TV show. The main event takes place Saturday from 9:00 a.m. to 4:00 p.m. and Sunday from 9:00 a.m. to noon on Bay Street in Old Town. The event also includes a classic Saturday night cruise, a poker walk and raffles with lots of prizes, best-in-show merchant awards and a People’s Choice award for cars, and themed music both days by DJ Russ Strohmeyer in Historic Old Town Florence. 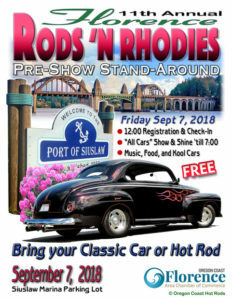 New this year will be an all-comers “Kool Car Stand-Around” show-and-shine on Friday at the Port of Siuslaw parking lot at the east end of Bay St. with food and music. Owners of any classic car are welcome to exhibit along with the invited vehicles. Check-in for this free event begins at noon and the event ends at 7:00 p.m.
For more information about Rods ’N Rhodies and the Community-wide Garage Sale, call 541-997-3128, or e-mail events@florencechamber.com. SPECIAL THANKS TO OUR EVENT SPONSORS – Les Schwab, Banner Bank, Florence In Bloom and Three Rivers Casino.